Most people understand the importance of eye protection when operating machinery and using power tools. Their power and the noise they make convey a sense of danger about them. Who wouldn’t feel inclined to put on safety glasses when using a chainsaw? On the other hand, the dangers of the kitchen environment to the eyes are less appreciated and may even seem silly. However, it only takes one accident to damage your eyesight. When cooking grease gets hotter than the boiling point of water, it will instantly flash water into steam. What this means is that a liquid (water) rapidly expands into a gas (steam). This is essentially the description of an explosion. Most food contains some moisture, which is why spattering hot grease is such a common kitchen occurrence. When grease is overheated, the spattering violence increases. If it catches fire, you should never attempt to put it out with water. This will splatter burning grease in all directions. Instead, carefully cover the pan with a lid to smother the fire. Hot grease is one of the greatest eye hazards in the kitchen, and you really should wear safety glasses when cooking with it. Raw meat fluids contain microorganisms that may cause infection after coming into contact with the eye. Chicken held under tap water can cause splashing. A single drop going into the eye can expose you to bacteria such as Listeria. Listeria is common in chicken, can penetrate an intact cornea, and can cause an infection. Even cleaning vegetables carries some infection risk. For example, Salmonella can contaminate vegetables. Cleaning the kitchen involves a vigorous scrubbing mot ion with cleaning fluids. This can splash bleach, oven cleaners, and other harmful chemicals into the eyes. Sudden removal of a lid from boiling water or heated food with a high moisture content can subject the eyes to hot steam. This can also happen when super heated water flashes into steam. For example, if you’re heating a cup of water in the microwave, it can heat beyond its boiling point yet remain liquid water. Any disturbance to it such as adding sugar will cause some of it to violently turn into steam. A bottle of champagne has carbon dioxide under pressure. If the bottle is held near your face, the pressure can pop the cork out towards the eyes while you’re loosening it. The kitchen can become a busy place when preparing a large meal. Clutter on the floor, a loose rug, a slippery spill, or an open drawer below knee level can cause a fall. The eye can hit a hard edge or get scalded when a hand reaches out and grabs the wrong object. Hot spices that feel hot to the tongue can cause great pain if they get into the eyes. While they may become airborne and reach the eyes, they often get onto the hands and fingers, which then rub the eyes. Eye protection won’t guaranty that you won’t inadvertently rub your eyes, but it makes it less likely. Wearing gloves while manipulating spices and discarding the gloves when you’re finished is an effective solution. If you are wearing prescription glasses, wearing non-prescription eye protection over your glasses is a clumsy and uncomfortable arrangement. On the other hand, prescription safety glasses are just as comfortable and convenient as your regular glasses. 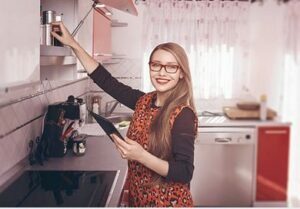 One simple glasses changeover before starting your cooking or cleaning is all it takes and you’re ready to go. Of course, you can also use your prescription safety glasses for yard work and home projects where eye protection is a good idea. If you’re having difficulties selecting the right prescription safety glasses or have questions, don’t hesitate to contact us.